Dubai: For most trainers across the world, the Group 1 Melbourne Cup is one of the most sought-after prizes in horse racing. 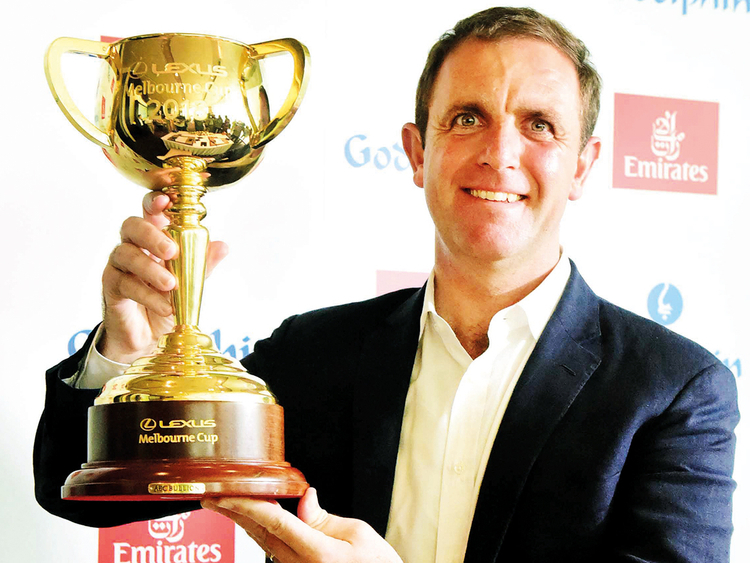 But Godolphin’s Charlie Appleby, says winning the Epsom Derby rank’s higher than claiming Australia’s most famous race, which he famously won last Tuesday with the English-trained stayer, Cross Counter. “To me, it’s always going to go down as the most memorable day of my career,” Appleby said in a bold statement in Dubai on Sunday, while reflecting on Masar’s historic win in the British Classic in June, before he laid out his agenda for the critical years ahead. “Not just because I am an Englishman, and it was the Derby on my home ground but especially as it had never been won before in the Godolphin blue. Mind you the Melbourne Cup is a very treasured trophy that we have here, but it’s fantastic to win the Epsom Derby. Appleby may only be in his sixth season as a fully-licenced trainer, but he has already sampled success in seven countries culminating in Tuesday’s Melbourne Cup, where Cross Counter gifted Godolphin, the stable created by His Highness Shaikh Mohammad Bin Rashid Al Maktoum, Vice-President and Prime Minister of the UAE and Ruler of Dubai, with a first-ever success in the great race. Asked what was the next target, Appleby said, smiling: “The Kentucky Derby is on everyone’s lips, I guess. It’s not been done before so that’s an obvious target. “And of course winning the Dubai World Cup. Saeed (Bin Surour) is very good at it and I’ve had to play second fiddle. As always the Carnival horses will progress and if there’s a horse that I feel can be competitive in the race, I’ll be there. “But yes, these and every international Group 1 race is exciting. “But you don’t want to sit back and say we’ve done well, because if you do, you soon will be surpassed again. Asked to reflect on watching his first Epsom Derby Appleby revealed that he was hugely impressed with Generous, who won the race in 1991. “That was the past but we always look to the future as Shaikh Mohammad always instills in us,” he said. “Thankfully I have my own personal memory of the Derby, with Masar, and we now are looking for the next Masar. Hopefully we can have one wintering in Dubai this year and get on the Classic road once again. “My ambition is to keep trying to do the best we can for Godolphin and Shaikh Mohammad, because he is so delighted every time we have an international winner. It’s a huge sense of achievement. Appleby revealed that Shaikh Mohammad has always been the driving force with Godolphin, just as he was when the stable was launched almost 25 years ago. “Shaikh Mohammad is running a country and what we’ve seen develop here in Dubai over the last 20 years has been nothing short of amazing,” he said. “The horse is very close to Shaikh Mohammad’s heart and this year we’ve been around visiting the major horse sales and more importantly the stud farms at Keeneland, Gainsborough, Kildangan and Dalham Hall to see some of the two-year-olds.